I am at a Starbucks out of town, while on a road trip with Greg. I noticed when walking in this place that it was unusually crowded. I peered around for a vacant table – and then I saw it. The only empty table in the place. A lonely LARGE table. This table holds eight people. It is empty. There are many smaller tables around it – all full. It is awkward. Little old me at such a large table. By myself. Alone. Throughout the years I have witnessed people alone at a table for two in restaurants. I'm sure they are uncomfortable. They avoid eye contact, are often reading a book or a magazine and trying to “appear” busy. At the few times I have found myself alone out in public having to eat alone at a table for two – it is very awkward. I try not to feel that way – but the society in which we live – dictates that to be alone means something dreadful and sad. You feel people watching you – you want to scream, “I'm only alone because I am choosing it” but it is no use. Alone is alone. No matter how you slice it. Many people find themselves alone at different seasons in life. Usually it is not planned, can happen suddenly and takes them by surprise. Being alone is an unpleasant prospect. Being alone out in public – even scarier. Especially for women. I have often marveled at how people, once in a long-term relationship and suddenly alone, can begin again. They takes the necessary steps to go out in public again – and even after time *gasp* – begin the thought process of dating again. *Double gasp* The first time around is scary enough for anyone – why oh WHY would anyone choose to do it again? – I've always thought. But at the same time – I am amazed and warmed by those who have not only taken steps to not be alone – but actually find someone else. The chances for 'love the second time around' are really great!! And I have witnessed this marvel – many times over the years. Usually it is a long time friend, who also finds them-self alone or in this technically advanced society – through online dating sites. The holidays can be wonderful – but also very lonely. Especially for those who have lost a mate, child or friend. There are so many sad songs surrounding the holidays. Some of the best lyrics involve sadness and loss. You would have to be intensely naive – to think that this season is automatically joyful for all. If you are alone this season, the best thing you can do is get out and be with people. Attend a church service, holiday concert or an invite to a Christmas party. You may find that the warmth of friendship is your anchor and will bring you additional courage in the months to come. And because you are alone – your relationship with others in your life will become much more precious and you will now have time to renew old ties. If you have The Lord in your life – you know how much of a comfort it is to have a friend that “sticks closer than a brother” and who knows it all. He will become more dear to you during this time. If you know someone who is alone for the first time this season – invite them over. Be a friend. Look around. Notice the ones who are alone in your church services. Get involved. Show gentleness and compassion. Spread love around. Sprinkle kindness. Stir in humor. Fold in understanding. Bring true meaning to the season this year. Make someone's Christmas truly special. You may be the only person who can. If my feet are happy – then everything about me is also happy. I have worn my share of uncomfortable shoes over the years – high heel torture devices meant to pinch the toes and cause all sorts of trouble to the feet, not the least of which are bunions and in-grown toenails. Years ago I learned that high heels are not good for anyone to wear and even now years later the highest heel I will wear (for special occasions) is about 2 inches tall. Things like my daughters wedding (those strappy sandals were MURDER on my feet – but they were very dainty and pretty. And other very formal events that require a heel in order for the outfit to look right. Now a days, you will see me in clogs, tennis shoes, clarks sandals or my new favorite, Bob's canvas slip-ons. 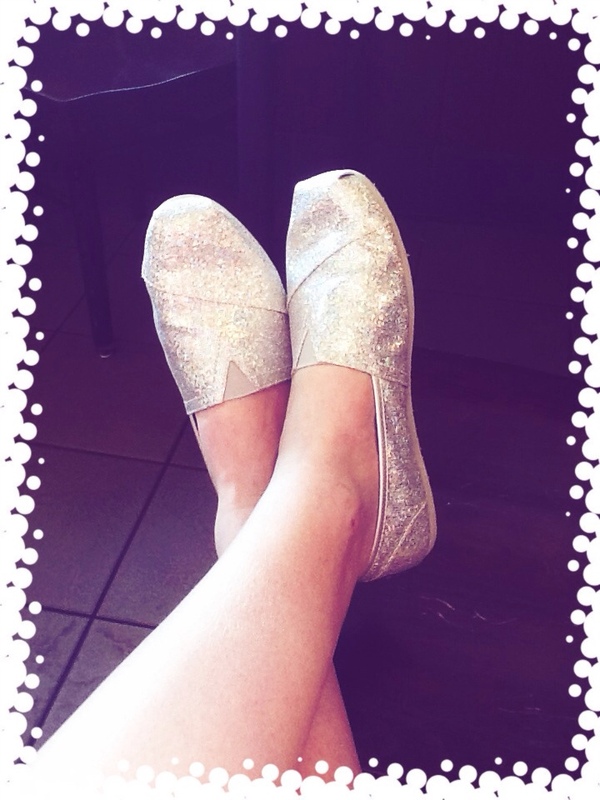 My favorite (and only pair) are silver glitter and SO COMFORTABLE!!! I do have orthotics that I put inside of every pair of shoes – or else an insert made for the high arch. Otherwise, to me they just wouldn't be as comfortable. I need my arches cushioned and supported or my feet are NOT happy campers. I found mine at Amazon.com for about $34 with free shipping. What do your feet wear for comfort?